Monday 17th May 1880 was a momentous day for the Methodist's of Stockingford, they were about to lay the first stone of their new Chapel. Up until now the current membership which totaled 40, and about 150 attended the services at the Midland Brick and Tile Works reading room, kindly given by Reginald Stanley, but the accommodation it afforded was so utterly inadequate to the requirements of the congregation that the erection of a commodious building was deemed necessary by the leading members of the Society. 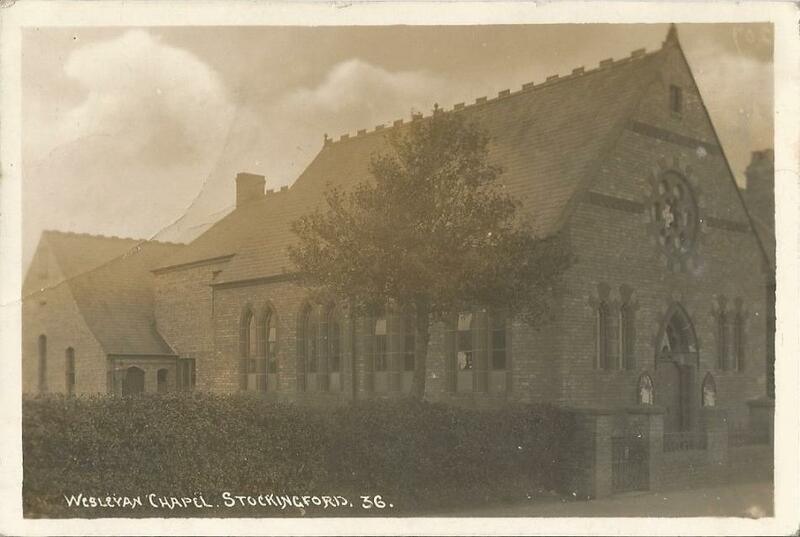 A postcard of the Chapel with the schoolrooms just in shot on the left of the photo. From my own collection. Mr Thomas Hill of Nuneaton was already six weeks into the build, working from the plans draw up by the architect Mr T Wills of Derby, at a cost of £600 made up of voluntary contributions, collections and a grant from the Wesleyan Extension Fund. The Chapel was in a Gothic style composed of buff bricks with facings of red terracotta and will accommodate 240 people. The weather was beautifully fine and as half past one o'clock approached their was a gathering of faces at the mission room and from there a procession of ministers, stone layers, members of the society and the trustees of the chapel walked up the road to the site of the ceremony followed by the Sunday school teachers and scholars. The trustees of the Church (Mr T Horton, Mr A H Rogers, Mr R Stanley and Mr J Vernon) stepped forward and handed the trowel in turn to Jacob Stanley (Reginald's brother) was the first to lay a stone on behalf of his father Rev J Stanley of Wandsworth, followed by Mr J Franks, Mr D Bassett and the Rev J Bunting for Mr John Evans. A collection was made during the day which amounted to £165 a great amount toward the fund and certainly made the day a sucess. Afterwards, thanks to Mr Titus Robottom a 350 strong party sat down for tea in a spacious marquee and a short speech was made by Rev Watkinson on the 'ups and downs of life' followed by some anthems, well rendered by the local choir. The Nuneaton Observer used the opening line of 'interesting ceremony' for the laying of the Memorial Stones at the new Stockingford schoolrooms. Thursday afternoon amidst a large number of the members and friends of the chapel, the V.I.P's present were as follows. Rev M Symons (Superintendent of Nuneaton), W H Gill (Atherstone) W J Chant (Lancaster) Mr T Argyle (Tamworth) Mr & Mrs Stanley, Mr & Mrs W Standley and Mr & Mrs Train (Nuneaton), Mrs T Newcomen and party (Athertone, Mr Mauston (Leicester), Mr Thos Caloe (Sileby), Mr Thos Horton (Superintendent of the School). The Schoolroom will be erected by Mr Thomas Smith of Chilvers Coton, behind the current chapel and will be 96 feet in length and 24 feet wide and contains sufficient room for upwards 200 scholars and will be one storey high, with ventilation to keep the those in attendance comfortable. The proceedings commenced in the Chapel where Rev W S Gill offered prayers before making their way to the side of the current building and the stone laying ceremony began. The first stone was laid by Mrs R Stanley (see right), Rev Symons presented her with a copy of Wesley hymns to remind her of the day. Reginald spoke for the pair saying He and Mrs Stanley were very pleased that they were able to take part in the ceremony, and were also glad that such good work was being done in the neighbourhood. The schoolroom being built owed alot to the contributions of those connected with the Chapel and not some magnificent gift. Mr T Argyle laid the next stone, again a Wesley Hymn book was given and spoke a few words to express how happy he was to be a part of the great work they do and will continue to support them for years to come. 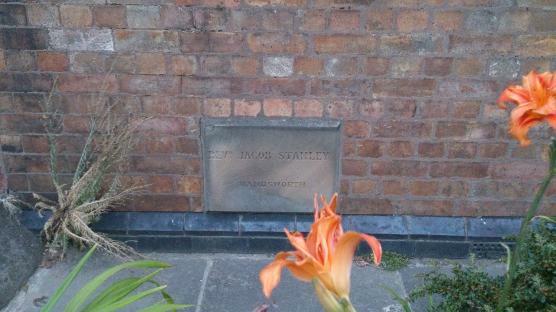 The final stone was to be laid by Mr S Jevons of Birmingham, but he was unable to attend and it was kindly laid by Mr Rogers. A number of other bricks were then laid including Mrs Rogers, Miss Rogers, Mr Hunt, Mrs Timson, Mr G Wilson (Chilvers Coton) and many others. A public tea was help in the Chapel afterwards, to which over 200 sat down and did ample justice with the good things provided. Stockingford was an important area for Reginald. He was happy to help build a future for the Methodist Church and the neighbourhood where the majority of his work force lived. 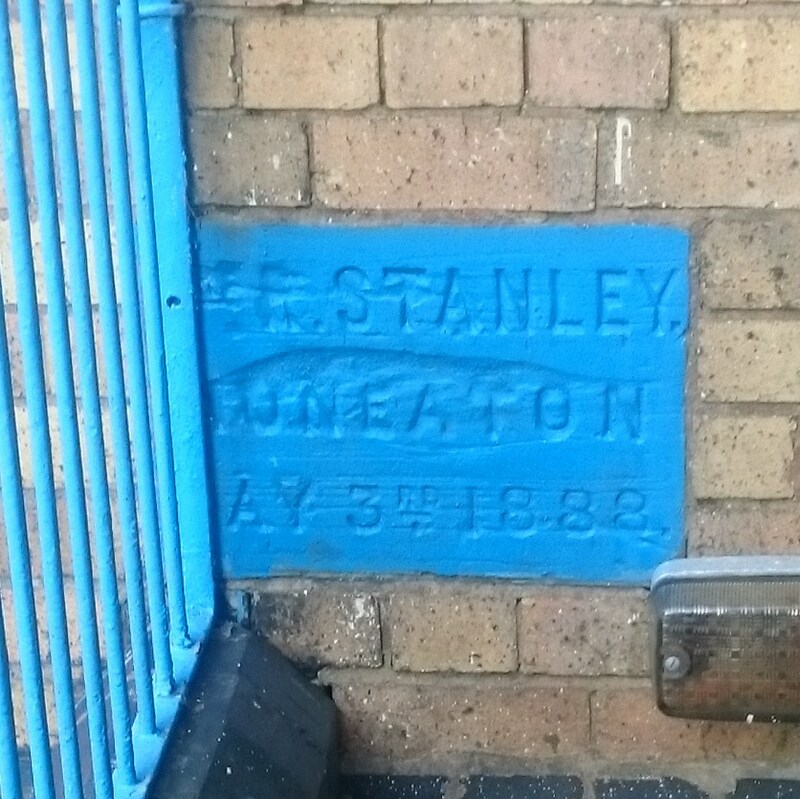 Some bright spark destroyed one of the plaques laid by Mr T Argyle, you can also see the bricks with initials on them (2016).